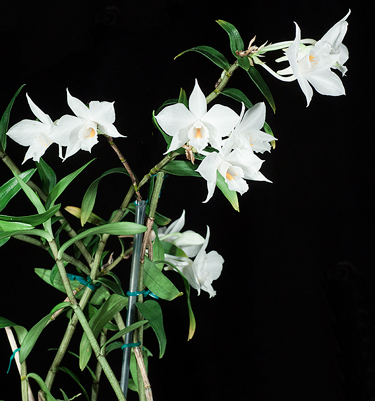 Dendrobium wattii outcross Treated #92047 ('5805' x '5798') (approximately 25 seedlings per flask). These seedlings have been treated to alter the chromosome count. This does not guarantee that they will be 4N. For more information go to Ploidy. 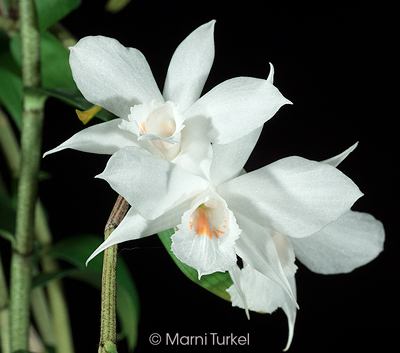 The Species: This is found in the Himalayas from northeast India through Thailand, Laos, Vietnam and into China at elevations from 5000 to 8500 ft. Dendrobium wattii is in the nigro-hirsute (black haired) section of Dendrobium. The plants are moderate size, up to 14" tall with an inflorescence that carries 2 to 3 flowers in the late winter or early spring. Culture: This comes from a monsoon climate and gets warm, wet summers and cooler, drier winters. During the growing season, plants should dry out and should be fertilized regularly. In the winter, they get less water but shouldn't be allowed to go dry for extended periods of time and fertilizer should be discontinued if possible. Light can be brighter in the winter. These can be grown potted using a relatively small pot in a medium that drains well. A fine bark mix has worked well for me. They can also be grown mounted.